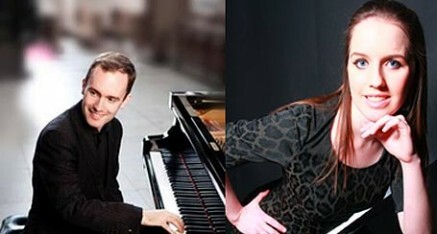 Concert pianists Simon Callaghan and Clíodna Shanahan’s distinguished performing careers have taken them to festivals and concert halls throughout Japan, Malaysia, Thailand, South Korea, Vietnam, India, Austria, France, Belgium, Switzerland, and Spain, and have led to broadcasts on RTE and BBC television and radio. They first began performing together as students at the Royal College of Music, London. UK engagements have included Wigmore Hall, Southbank Centre, Barbican Hall, Birmingham Symphony Hall, St. David’s Hall Cardiff, Riverfront Hall Belfast, NCH Dublin and Liverpool Philharmonic Hall. Highlights of their respective careers have included collaborations with English National Opera and London Philharmonic Orchestra principals, the Maggini, Sacconi, and Carducci Quartets, actors Samuel and Timothy West and choreographer Wayne McGregor. Between them, they have worked with many orchestras including the Royal Liverpool Philharmonic Orchestra, London Symphony Orchestra, and the Orchestra of the Royal Opera House, Covent Garden. Simon is Head of Piano at the Ingenium Summer Academy (Winchester) and Artistic Director of Conway Hall Sunday Concerts, the longest-running chamber music series in Europe. Clíodna also enjoys an active career as an organist, most recently making her début on the magnificent Royal Albert Hall organ at the BBC Proms.